For many bettors, placing a moneyline wager is the simplest way to make a bet. A moneyline wager is as straightforward as it comes, as it’s always on who’s going to win a game or match, whether it be between two teams or two players. However, in some sports, a three-way moneyline exists where sports bettors have the option of betting one of two sides, but they also have a third option—a tie. 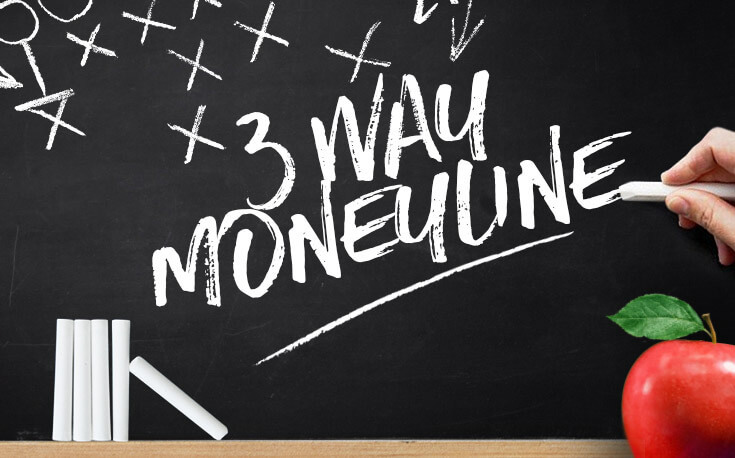 For a deeper look at how to bet three-way moneylines, as well as which sports you can expect to find these wagers within, read on! Whereas a typical moneyline bet involves a bet on one of two options, three-way moneyline betting involves three options. A three-way moneyline means you can bet either Team A to win, Team B to win, or on the Tie to win. These sort of bets come into play for some sports where the result may end in a tie and, as such, a winner cannot be determined through regular game time. In many cases, betting a three-way moneyline will offer more value to bettors than a traditional moneyline bet as it’s harder to predict. While several sports involve some sort of overtime when games are tied, oddsmakers primarily employ three-way moneyline bets in two sports, hockey and soccer. Wagers in soccer are decided after full-time. That means after the full 90 minutes, plus any additional time that is added by the referee for injuries, stoppages, or any other reason. Unlike in other sports, ties (“draws” in soccer terms) are extremely common due to the lower-scoring nature of the game. In fact, draws occur so often in soccer that three-way moneyline betting is the most standard and popular way to bet on a soccer match. However, there are many more ways to bet the sport as well. However, while regular season matches may end in a draw, some tournament-style matches will extend into extra time and possibly into penalties. In this case, should you place a three-way moneyline wager on a team to win and they do so after full-time, your bet will be graded as a loss. Even in some tournaments (where winners are guaranteed, thanks to penalties), three-way moneyline bets are predicated on a result being determined in the 90 minutes of full-time play. While there are many hockey leagues around the world, odds are when betting hockey you’ll be betting on the National Hockey League (NHL). Standard moneyline betting also exists in the NHL. However because games can end tied after three periods, prior to an overtime period and possible shootout, three-way moneyline bets are also offered on hockey. In hockey, a typical moneyline bet covers your selected team to win at any time or via any method in a game. Whether your team wins after three periods, during overtime or through a shootout, if the team you pick wins—you win. Now let’s look at what three-way moneyline odds would look like for this same game. Because you’ll be choosing what the outcome of the game will be after three periods of play and eliminating any overtime, making a correct selection will be harder, which will be reflected in the odds offered on that option. As you can see below, Vegas is still favorited. However, in the three-way moneyline option, odds for both Vegas and Vancouver are longer, or will pay out more should you bet them through this method. The tie is deemed the least likely option with the longest odds. Betting the tie means you are betting the score to be tied at the end of three periods. Obviously, every game played in the NHL has a winner. As part of the post-2004-2005 lockout collective bargaining agreement, the NHL eliminated the tie prior to the 2005-2006 season. So if you’re looking for better value, longer odds, and higher payouts, three-way moneyline betting is the way to go. But remember, if you’re betting on a winner of the game, should they win in overtime or a shootout, that bet is toast. Remember that a three-way moneyline isn’t always the safest bet as your team will need to win before the end of regulation to cash your ticket. Ready to Learn More Betting Terms and Strategies? Three-way moneyline betting is just one of numerous ways to bet sports. If you’re looking to learn more about betting terms, strategies and the sports betting industry, be sure to visit our 101 guides to sports betting.